When you own a unique type of grass, it means carefully selecting your garden care tools. St. Augustine grass is more tolerant to salt than other turf types and therefore prevalent in humid, subtropical areas. The grass has a blue-green shade and is grown widely in warm, coastal states like Florida. The grass can grow well on many types of soil as long as they are drained well. Also called carpet grass, this turf creates a smooth surface that is unique tolerant to low moisture, high salt, and very high temperatures. It keeps its vibrant color for longer than other types of grass when the weather turns cool and doesn’t need to be mowed quite as often. Although this grass is low maintenance, it still performs better when it has the right care. After planting, the grass should be watered a few times a day for the first 10 days or so. As soon as the roots have grown, watering at ¼ to ½ inch once each day is enough. You can then gradually reduce watering times until your St. Augustine lawn has grown in fully. After 14 days, you can mow the lawn down to between 1 and 3 inches, then mow every week or two. 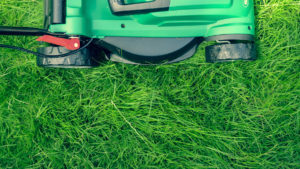 The following mowers were selected for their ability to effectively mow St. Augustine grass. Each was chosen for its price to value ratio and overall quality based on user reviews.